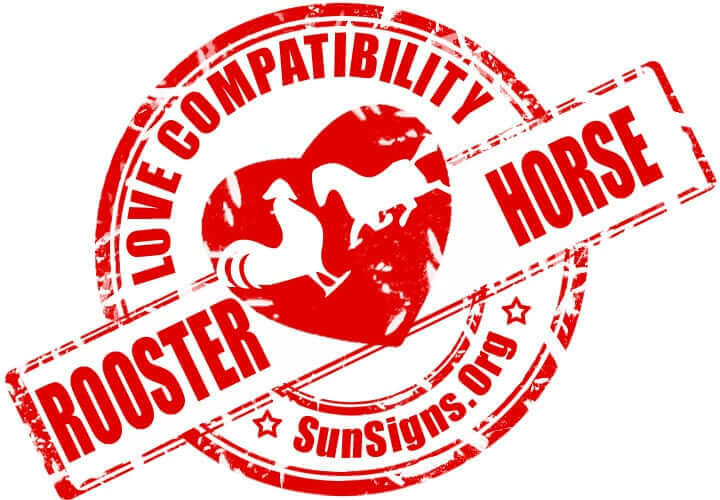 The rooster horse love compatibility between these two Chinese zodiac signs is wonderful. They can form a good pair together. It is kind of surprising then that the rooster, who demands perfectionism is able to be happy with the horse. For these two to be happy together, the rooster and horse relationship will depend on the horse’s ability to be flexible. At the same time, the rooster has to be able to refrain from demanding too much. The Chinese zodiac rooster and horse friendship can be pretty good. The roosters are very intelligent, detail oriented and perfectionists. The horse will also find these attributes pretty appealing. They are very clever and stimulating. They have a pretty wide range of knowledge on different subjects. They get attracted to the rooster’s very specific knowledge base. The rooster and horse compatibility forms a pretty strange relationship. Even when they are dating, this love match will only work out if the horse stops wandering. The rooster and horse in love might not have an easy time understanding each other. These two Chinese animal astrology signs will be most successful if they can be attracted to personalities that are contrasting. Additionally, they will need to find something that they can agree on together. The male or female horse is entertaining and talented. They can be restless and will run off as soon as boredom sets in. This might mean any mess that is created is going to have to be cleaned up by their partner. They do not care enough about the consequences. They have a free spirit and will not want to put down roots and live the life the rooster man or woman has planned. They will want to follow a different path, one that is more daring instead and not fixed. They tend to be pretty restless. The male or female rooster is envious and somewhat somber. They might not be happy with their fickle lover. They are brash and critical. They like planning and will have things laid out exactly as they want them. Even in bed, the rooster and horse can be sexually compatible only if they make some compromises. The Chinese rooster and horse compatibility might run into problems if they live together and are in a romantic marriage. Roosters are very devoted and can be very trusting. They can be very demanding of those around them. Because they are very meticulous about appearances, their demands for a pristine house can become annoying to those that live with them. Criticizing is something they will give in to if they are not careful. Horse will have problems finishing projects once they start them. They are likely to begin a project and leave it somewhere in the middle. This is usually because the horse man or woman has found something else they want to do. The rooster lover can lose patience with the horse’s lack of capability when it comes to concentrating on something or finishing a project. On top of that, long-lasting relationships have never been the horse’s strong point. The rooster and horse soulmates are both intelligent and can form a strong mental connection. Rooster & Horse Chinese Horoscope Compatibility Horse rated 4 Hearts!